Built in 1942 by Bartram and Sons at South Dock for Reardon Smith Line Ltd., Bideford. 6686 gt: LOA 131.1: Beam 17.3m: Service speed 10.5 kts. 1942 Jersey City, Reardon Smith Line Ltd., Bideford. 1955 Jaqueline, Lion SS Co A/B, Billingsfors, Sweden. 1955 Jaqueline, A/B Billingsfors-Langed, Billingsfors, Sweden. 1959 Kopalnia Szombierki, Polish SS Co., Szczecin. 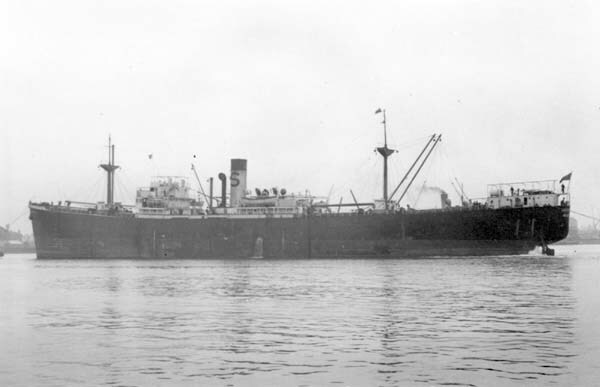 1978 After being hulked in 1964, it was not until 1978 that she was finally broken up at Faslane by Shipbreaking Industries Ltd.
Jersey City 1942 to 1955.